The Internet is littered with stories of “chemtrails” and geoengineering to combat “global warming” and until recently I took these stories with a grain of salt. One of the main reasons for my skepticism was that I rarely saw what they were describing in the skies. But over the past several years I have notice a great number of these trails and I have to admit they are not like the contrails I grew up seeing in the skies. They are extensive, quite broad, are laid in a definite pattern and slowly evolve into artificial clouds. Of particular concern is that there are now so many­dozens every day are littering the skies. Win-Shwe T-T, Fujimaki H. Nanoparticles and Neurotoxicity. In J Mol Sci 2011;12:6267-6280. Krewski D et al. Human health rRevell PA. The biological effects of nanoparticles. Risk assessment for aluminum, aluminum oxide, and aluminum hydroxide. J Toxicol Environ Health B Crit Rev 2007;10(suppl 1): 1-269. Blaylock RL. Aluminum induced immunoexcitotoxicity in neurodevelopmental and neurodegenerative disorders. Curr Inorg Chem 2012;2:46-53. Tomljenovic L. Aluminum and Alzheimer’s disease: after a century, is their a plausible link. J Alzheimer’s Disease 2011;23:567-598. Perl DP, Good PF. Aluminum, Alzheimer’s Disease, and the olfactory system. Ann NY Acad Sci 1991;640:8-13. Shaw CA, Petrik MS. Aluminum hydroxide injections lead to motor deficits and motor neuron degeneration. J Inorg Biochem 2009;103:1555-1562. Braydich-Stolie LK et al. Nanosized aluminum altered immune function. ACS Nano 2010:4:3661-3670. Li XB et al. Glia activation induced by peripheral administration of aluminum oxide nanoparticles in rat brains. Nanomedicine 2009;5:473-479. Exley C, house E. Aluminum in the human brain. Monatsh Chem 2011;142:357-363. Nayak P, Chatterjee AK. Effects of aluminum exposure on brain glutamate and GABA system: an experimental study in rats. Food Chem Toxicol 2001;39:1285-1289. Tsunoda M, Sharma RP. Modulation of tumor necrosis factor alpha expression in mouse brain after exposure to aluminum in drinking water. Arch Toxicol 1999;73:419-426. Matyja E. Aluminum changes glutamate –mediated neurotoxicity in organotypic cultures of rat hippocampus. Folia Neuropathol 2000;38:47-53. Walton JR. Aluminum in hippocampal neurons from human with Alzheimer’s disease. Neurotoxicology 2006;27:385-394. Walton JR. An aluminum-based rat model for Alzheimer’s disease exhibits oxidative damage, inhibition of PP2A activity, hyperphosphorylated tau and granulovacuolar degeneration. J Inorg Biochem 2007;101:1275-1284. Becaria A et al. Aluminum and copper in drinking water enhance inflammatory or oxidative events specifically in brain. J Neuroimmunol 2006;176:16-23. Exley C. A molecular mechanism for aluminum-induced Alzheimer’s disease. J Inorg Biochem 1999;76:133-140. Exley C. The pro-oxidant activity ofnaluminum. Free Rad Biol Med 2004;36:380-387. Note from Martini: If you have read this article by Dr. Russell Blaylock you now know how serious it is. If its not stopped, there is no going back as he states. I know through grassroots efforts this can be published everywhere, to the military, pilot organizations and all members of Congress,etc. We are being poisoned so many ways, and there is no place to hide. See Dr. Blaylock’s pilot alert on aspartame as well. http://www.mpwhi.com/pilot_aspartame_alert.htm Note how many pilots died on American within a short time from aspartame, as reported by Captain Fred Fox, our representative for Aviation safety. There are a lot of FAA people on our lists who warn pilots with this alert, as well as consumers and activists and now we want to add the above article to get to even more pilots. Many have their own networks. When I fly I make copies including the FDA list of 92 symptoms not only for all the pilots but also flight attendants. You can even ask the attendants if the pilots are using it. I say, “if they are using it I’m out of here”. Your life is in the hands of the pilots! Dr. Blaylock is a world renowned neurosurgeon, retired from Neurosurgey to devote his full attention to nutritional studies and research. An in-demand guest for radio and TV programs, he lectures extensively to both lay audiences and physicians on nutrition-related subjects. He is the 2004 recipient of the Integrity in Science Award granted by the Weston A Price Foundation and serves on the editorial staff of the Journal of the American Nutraceutical Association and is a member of the editorial board of the Journal of American Physicians and Surgeons, the official publication of the Association of American Physicians and Surgeons. Don’t stop forwarding this article. The pilots and their families as well as those on the ground must be saved. Send it to everyone you know and those who can network it further. This insanity must stop. Radioactive Waste Over 100 Bq/Kg Used To Be Stored Like This (Pic) … NOW 100Bq/Kg Is The Food Safety Limit! Carnicom Institute is a research and publishing organization dealing directly with the health effects of these aerosol operations. We are engaged now in the Morgellons Research Project (MRP) which is studying the identifiable characteristics of the Morgellons Condition. We have a staff of doctors now assisting us. Please visit carnicominstitute.org for more information. Thank you. Dr. Blaylock…….I grew up in America’s heartland nothing but farms all around. My question is this I know that pesticides and other nasty chemicals were frequently sprayed because they made me sick with frequent bouts of tonsillitis bronchitis colds and skin reactions. When my family moved back to my home city we lived in an heavily industrialized area w/a coal fired power plant no more than 4 miles away as well as a fertilizer plant and an industrial chemical solvent plant. I have always been clumsy the kind that trip’s over her own feet, I developed asthma about ten years ago and now I have COPD as well. I’m also dealing with symptoms of multiple sclerosis for which I have not been diagnosed as of yet could all of this be related or possibly linked to what I grew up and lived around? I have many questions and too few answers please answer if you have the time if you don’t I understand. You cannot reach Dr. Blaylock through this website. However, I will reply to your questions (tomorrow … if I can find some time). So far I am having a terribly busy week. All those health problems that you’re describing are absolutely linked to the environment in which you grew up and have been living in. In the clinic where I’ve been working we saw a lot of cases like yours. Your body has always done its best to get rid of all this toxic stuff that it had to deal with every day and what it wasn’t able to get rid off it stored where it caused the least damage to your system (fat tissue, connective tissue etc.). When finally the body cannot ‘safely’ store all this toxic garbage anymore it gets sick. If those frequent bouts of tonsillitis, bronchitis, colds that you’ve mentioned were treated with antibiotics then according to alternative medicine the pathogenic facters were moved from more superficial parts to deeper parts of your system causing you to develop asthma later on. Did you know that drinking to much Coke Zero could cause you developing symptoms of multiple sclerosis because of its Aspartame content? The air that we breathe, the water we drink and the food we eat are more often than not negatively affecting our health. Our food for example contains a lot of toxic substances like pesticides (that contain fluoride), herbicides (like Roundup), antibiotics, fungicides food additives (like Aspartame and MSG). Water fluoridation is also devastating for our health. But NOW let’s focus on what you could do to heal yourself. … and I can tell you that Hippocrates was right. Nature heals whereas western medicine is just treating and suppressing symptoms. Symptoms that were meant as warning signs from our body that it needs help and that we need to change in order to get well again. Suppressing those symptoms leads to much greater health problems later on. People often ask if Dr. Max Gerson’s and Ann Wigmore’s and other therapies are so successful for treating cancer and other diseases as well, why are they not used and prescribed by their local doctors? …substances that cannot be patented and made billions with. Doctors these days have become more or less BigPharma’s salesman. Real doctors have become rare indeed. Some of my friends are real doctors, but they use alternative medicine. Am I correct that you have no background knowledge in alternative medicine? I will tell you what I would do if I were you, but I highly recommend that you seek the help from a really good health practitioner. Your health practitioner will advise you to start slowly with what I am telling you now. – How To Improve Your Health Condition Dramatically And Protect & Detoxify Your Body From Fluoride, Arsenic etc. Distilled water will pull all the inorganic toxic matter and solvents right out of your body. Distilled water does leech minerals from your body BUT ONLY inorganic minerals that are toxic and useless for the human body. – Fresh Vegetable and Fruit Juices: What’s Missing in Your Body? 5. Do colon hydrotherapy several times to clean out the colon first. After having done that several times you may fell already some relief. They will greatly help you to detox your body. 7. Exercise: Tai Chi, Qi Gong, stretching are very beneficial if you like that kind of exercise. Well, there’s more that could be very beneficial for you like herbal medicine (to support the kidneys, the liver, strengthen your body and to kill parasites), homeopathy, acupuncture etc. but I’ll leave that to your doctor or health practitioner. I drink freshly made juices, make green smoothies (with my Vitamix), eat lots of different kinds of salads and lots of sprouts. I make different kinds of raw vegan bread (the Essene way) in my Sedona dehydrator. … but in the beginning I would not recommend it to you because the healing reactions would just be too strong (and you really have to have some knowwledge about this diet or you’ll make mistakes). Again, START SLOWLY, give yourself some time, learn something new everyday and integrate what you’ve learned. Slowly become your own doctor and heal yourself. 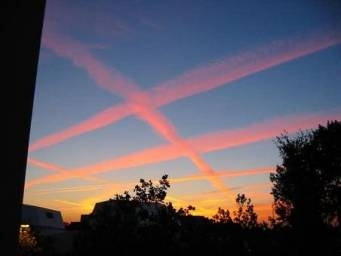 So air traffic control specifically authorizes commercial planes to fly in these patterns, as pictured above? Really? X’s would result in crashes if this was allowed! So are these really contrails from commercial planes, as the government broken record chants to us ad infinitum? What a coached speech, but also, what a glaring oversight of theirs! It is time for us to think. I don’t exactly think that commercial airliners are particularly interested in flying in O’s (vertical ones, heart patients on board anybody??) and U’s and maple leaf patterns, also vertical ones…eh? Contrails? Normal plane flight patterns? My foot. These are military stunts pilots, and no question about it. PS I have seen these planes flying at about helicopter height, ie very low, not high as the Feds keep chanting to us. Contrails? Ice crystals at great heights? Actually, I have seen several planes in take-off mode, still ascending into the air, leaving a LONG streak of white behind them. Guess what? It lingered, and lingered, and broadened…after twenty minutes….still while that plane was in the act of ascending. Ice crystals in the high altitudes? I don’t think so. As a matter of fact, I know so. They are not telling us the truth. Sorry to break it to you, folks.